The Town Council, in partnership with the Moorends Welfare Working Group, hosted a Community Gala in 2013 and this years event promises to be even more spectacular. 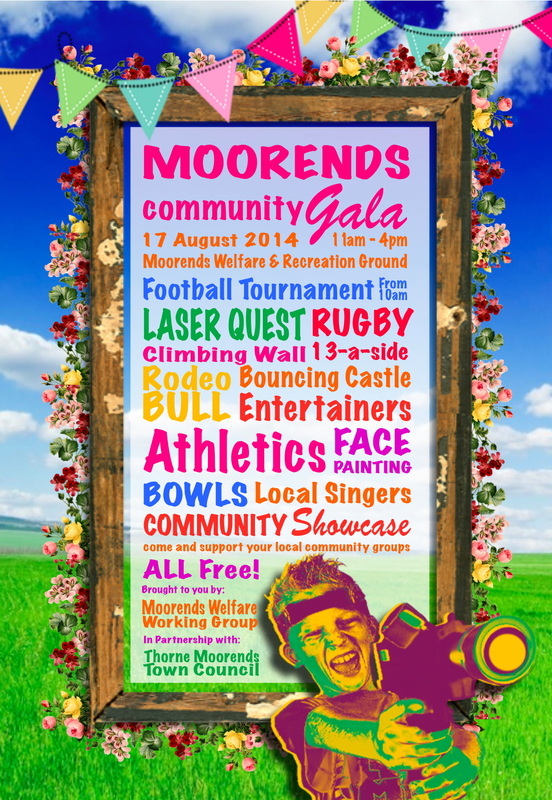 The focus of the event is to showcase local talent and community spirit whilst providing FREE fun for all the family. It is our pleasure to bring back a major community event in Moorends. Entry and activities will again be free of charge to members of the public. Highlights include Laser Quest, Rodeo Bull, MEGA Slide, Rugby 13-a-side, the HUGE climbing wall - all whilst performers take the stage to keep you entertained. The gala gives you the opportunity to support the users of the Welfare Ground, who dedicate hours to the community every week through volunteering by coaching, Football, Rugby and Cricket as well as hosing Bowls Competitions and the like. We hope to see as many people at this FREE event on 17 August 2014. Programmes will be available on the day! The Town Council, in partnership with the Moorends Welfare Working Group, hosted a Community Gala on the August 25th 2013. It was the first major community event to be held on the site in over ten years. Entry and activities were free of charge to members of the public and it is the first a hopefully annual event! The event was a great success, the feedback was brilliant and we're already working to make make next years event bigger and better!